The Xyron Everyday Stories albums features these patented page protectors to keep your photos and scrapbooking elements clean, crisp, and lasting for years to come. Made with 2 pages joined in the middle, these 8" x 12" page protectors feature a unique design that allows you to insert your photos, memorabilia, or scrapping blocks through the back while keeping everything secure and clear. The Xyron Everyday Stories Page Protector unit folds back to back to easily insert and display safely ad securely into your Xyron Everyday Stories photo album. Welcome to MyBinding Video. 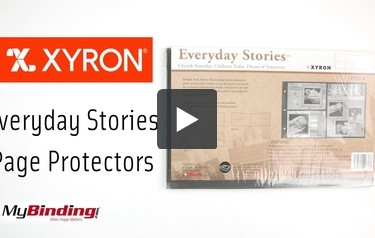 These are the Everyday Stories Page Protectors from Xyron. These page protectors give your photos and memorabilia clear presentation while keeping them secure. Essentially, each one is two pages joined in the middle, and when locked in a binder the open sides face each preventing anything from slipping out. These protectors are 8x12” and the binding edge is punched for 3 ring mini-binders. Each pack includes six protectors. For more videos and all your binding needs, visit MyBinding.com.